Simon meets with Grace to continue hearing her narration; her story has “come at last to the murders.” Simon tells Grace that he is “a doctor, not a judge,” and only wants to hear what Grace can remember of that day. Simon “plunges in,” asking Grace to confirm that Mr. Kinnear left for town on a Thursday. Grace assents, saying that when Mr. Kinnear left he told her, “Here’s your favorite beau, Grace, come and kiss him goodbye.” Simon asks if Mr. Kinnear was referring to McDermott, and Grace icily corrects him, saying Mr. Kinnear was referring to Charley Horse. Simon then asks Grace several questions about whether Mr. Kinnear ever made sexual advances to her; Grace is offended and says, “You are just like them at the Asylum, and the prison chaplains, and Dr. Bannerling and his filthy ideas!” Simon backs off, and instead asks Grace to explain what happened after Mr. Kinnear left that Thursday. Grace takes offense at the fact that Simon is so interested in knowing the details of her relationship to Mr. Kinnear. On the one hand, it seems completely reasonable that Grace would be offended by Simon’s line of questioning; her whole life, she has been treated by men as a sexual object, and she has already been subject to years of speculation regarding her relationship with McDermott. On the other hand, because this chapter is narrated in close third-person to Simon, it is difficult to know exactly why Grace is so repulsed by the suggestion that she had a sexual relationship with Mr. Kinnear. Though the reader might be just as tempted as Simon to know the answers to his questions, Grace’s passionate declaration that the men who are so interested in her are actually interested in their own sexual fantasies is nevertheless deserving of the reader’s compassion. Grace says that Nancy informed both her and McDermott that they were to leave in two days’ time; she then left to go to a friend’s house. Grace was distraught and took a few glasses of whiskey with McDermott, during which time he told her that he intended to “kill Nancy with the axe, and strangle her as well, and shoot Mr. Kinnear when he came back.” He insisted that Grace help him, and Grace tells Simon, “If I were not so upset [about being let go] I would have laughed at him, but I did not.” She says she felt “afraid of him; and […] had a strong feeling as if it was fated, and it couldn’t be avoided, no matter what [she] did.” When Simon asks why Grace did not warn Nancy, she replies that McDermott could have easily denied her allegations by calling her “a silly hysterical girl”; she also says she was afraid that McDermott might kill her if she warned Nancy. This passage is important because the reasons Grace gives for silently going along with McDermott’s plan and not warning Nancy of it are completely understandable given what the reader knows about Grace’s society. It seems entirely possible to think that McDermott could convince Nancy that Grace was lying and “hysterical,” and that McDermott might retaliate against Grace with violence. This passage thus highlights how difficult it is to judge Grace’s story, because of the complicated societal forces that confined her choices. The most striking aspect of this passage is the fact that, according to Grace, McDermott wanted to kill Nancy while she was sleeping because that way he would not have to worry about “her looking at him” while he murdered her. This suggests that McDermott might feel some level of shame about killing someone—yet, at the same time, the fact that he feels no qualms about killing Nancy while she is unconscious controverts this idea. Regardless, there is a powerfully sexual undertone to McDermott’s desire not to have Nancy look at him—as if he wants the murder to be dispassionate and divorced of intimacy. This passage is striking mostly because of what it says about Mr. Kinnear. Nancy’s claim that he would be aroused by the idea of her sleeping in his bed with Grace suggests that Mr. Kinnear is sexually excited by the idea of exerting sexual power over two women whom he already holds economic and social power over. Mr. Kinnear’s fantasy, articulated by Nancy, also fetishes lesbian relationships, which, if the reader interprets Grace as being a lesbian, could be seen as further evidence for Grace disliking Nancy. This passage is also important because it is difficult to know whether Grace is telling the truth in saying she warned Nancy of McDermott’s plot; it is left to the reader to determine whether Nancy brushing off such a warning seems plausible. Grace’s second dream is the same one with which the novel opened. The fact that Grace claims to have dreamed about Nancy’s murder and her own imprisonment before either of these events occurred imbues her with a kind of mystical power—if, that is, the reader believes that Grace actually dreamed this the night before Nancy was killed. Grace’s first dream, if the reader accepts that Mary Whitney has actually been possessing Grace’s body, is an indication that this possession is about to happen again. Regardless, the fact that Grace still feels guilty about Mary’s death speaks to how deeply Grace loved Mary, and how hard she is on herself. Grimm, Alexandra. "Alias Grace Chapter 35." LitCharts. LitCharts LLC, 7 Feb 2018. Web. 18 Apr 2019. Grimm, Alexandra. "Alias Grace Chapter 35." LitCharts LLC, February 7, 2018. 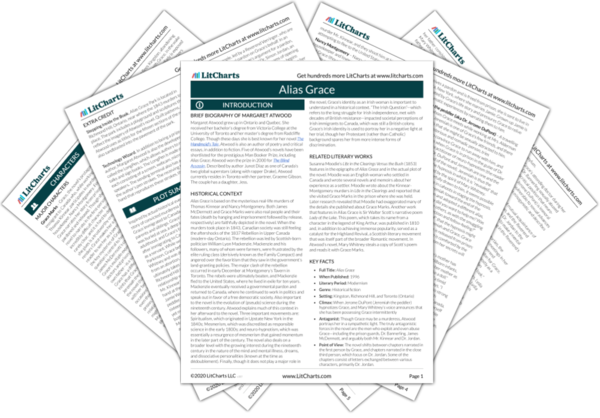 Retrieved April 18, 2019. https://www.litcharts.com/lit/alias-grace/chapter-35.